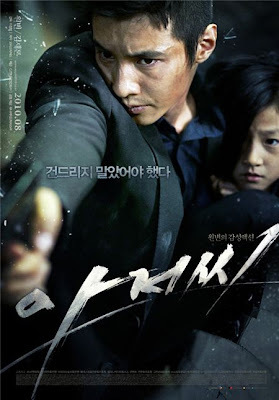 The biggest Korean movie of 2010, The Man From Nowhere has been both a commercial and critical hit, garnering over six million admissions at the box office and scores of accolades at the Blue Dragon, Daejong, and Korean Film Awards. Delivering the most representative performance of his career, Won Bin (Mother) won Best Actor at the Daejong and Korean Film Awards for his magnetic turn as a mysterious agent who goes to increasingly dangerous and desperate lengths to save a girl, played by award-winning child actress Kim Se Ron (Brand New Life). Four years after the acclaimed gangster drama Cruel Winter Blues, writer-director Lee Jeong Beom takes on the action thriller genre with a similar eye for humanity amid bloodshed, building the burgeoning violence around the protagonists' unlikely friendship. Tae Sik (Won Bin) runs a dusty pawn shop in a seedy neighborhood, and largely keeps to himself. The only person he's befriended is So Mi (Kim Se Ron), a young girl who likes to take refuge in his shop. Trouble knocks on Tae Sik's door when So Mi's junkie mother comes in to pawn a camera bag - a bag full of stolen drugs. Gangsters tear up the pawn shop to get the drugs back, and Tae Sik finds out in the process that So Mi and her mother have been abducted. Tae Sik can only hunt down the mob himself to save So Mi, even if doing so reveals his own dark past.